The M1200 has a 2x20 alphanumeric display for English language prompts and messages for the user. In addition, the display with VFD technology makes it easy to read on the plant floor. The M1200 has field-replaceable relays on board. The electromechanical relays, have the capability to drive any field device. Programmable number of stroke cycles between the detection of a slug fault and the deactivation of the E-Stop or T-Stop output. Programmable from 0-99. The M1200 can store setup information for up to 60 dies. A name of up to 8 characters identifies each die. Hot Keys make programming as well as accessing of information very easy for the operator. Cost Effective System with 4 Die Protection Inputs & 4 PLS Outputs for just $1500! 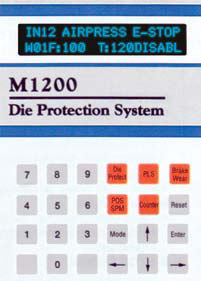 The M1200 allows 8 character names for sensors and for different setups. User can access program information using either numbers or names. With names (labels), the operators need not memorize, or refer to sheets for programming or accessing the information about a setup or sensor. Setting of position windows for sensors used to be a very time consuming, trial and error based procedure. With the M1200’s review screen, setup becomes extremely easy. During setup, the M1200 captures sensor events. User can review press angles where sensors became active during the press cycle, and then program the position windows & event type. accordingly, for each sensor. Quality Counter: Presettable 6 digit down counter that can be used to schedule periodic inspection of parts. Tool Counter: A tool counter is an up counter and keeps track of the total hits made by the associated tool that can be used to schedule periodic preventive maintenance of the dies. Total Counter: The total counter, an up counter, shows the total number of hits made by the press since last reset of the counter. Batch Counter: Presettable down counter de-energizing the Top Stop output when count becomes zero and is used for making batch of parts. Pos Hi: This event requires that the sensor input must be high within position window. If the sensor input is low anywhere within the window, it is considered as fault. The input must go low at least once anywhere outside the window. Pos Lo: This event is similar to Pos Hi except that it requires that the sensor input must be low within position window. If the sensor input is high anywhere within the window, it is considered as fault. Rising Edge: The sensor input must go from low to high level within the programmed window, and remain high for the rest of the window. Falling Edge: The sensor input must go from high to low level within the programmed window and remain low for rest of the window. Pulse: The sensor input must go from low to high to low again within the programmed window. This event type is useful in detecting part ejection. Most presses have two stop circuits: Emergency or E-Stop and Top or T-Stop. As the names imply, the E-Stop circuit is used to stop press immediately under emergency situations, while the Top Stop circuit stops the press at the top. Each sensor input can be programmed to activate either E-Stop or T-Stop under fault condition. The choice between E & T-Stops depends upon the event. The idea of die protection is to stop the press before any damage is done. M1200 has programmable engagement angle to avoid press sticking at bottom. The engagement angle is defined as the press position (before bottom) beyond which, if the press is stopped, it will engage with the stamping material and hence, likely to stick at bottom. To avoid sticking, the M1200 stops the press at top if an E-Stop fault is detected after the engagement angle. 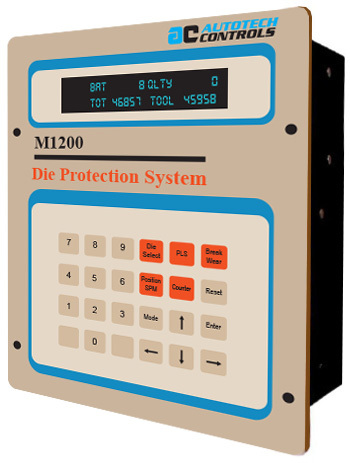 The Ml200 protects dies by monitoring events captured by various sensors. For effective die protection, the system must be able to detect a malfunctioning sensor. A defective sensor’s output remains stuck at low or high logic level, and does not change even when stimulating event occurs. The Ml200 detects and reports defective sensors by ensuring that each sensor output makes transition between the two states during each press cycle. The Ml200 has built-in hardware to detect a broken resolver connection. If one or more wires from the resolver are broken, the unit detects and warns user of broken cable fault by displaying fault on the display as well as by de-energizing a fail-safe, fault output. The M1200 has built-in features to detect broken resolver coupling/chain. If the resolver is stationary while the press is running, the Ml200 detects “No Motion” fault, warning the operator of possible broken resolver coupling or chain. Yet another problem in a die protection system may be the slippage between resolver and the press shaft. One of the inputs of M1200 along with a proximity sensor and a cam, can be used to detect a slippage problem.